Zirconia Crowns in Mexico - What is Zirconia? Before you travel to Mexico, learn more about Zirconia Crowns, including it’s advantages and disadvantage over PFM crowns. We are all familiar with the phrase “Diamonds are forever”. Diamonds are, of course, one of the hardest and most precious stones on Earth. They also happen to be extremely costly. What if you were able to replicate the properties of a diamond? You would certainly consider the idea. Anything that can incorporate relatively diamond-like physical attributes must really possess superior physical and esthetic properties. What if you were told that there is such a material, known as Zirconia? In fact, you’ll be dazzled by sparkles of Zirconia when you walk into a jewelry store. What you see on display are mostly cubic Zirconia for big stones. For security reasons, many don’t display real diamonds on the jewelry settings. Once you buy an engagement ring for example, they will replace the cubic zirconium on the setting with a real diamond. Zirconium is derivative of a naturally occurring mineral called “baddeleyite” found on Earth. Zirconia is zirconium dioxide, which can be made into many forms. A certain cubic structure of zirconia, known as cubic zirconia, resembles diamonds, hence its diamond-like esthetics. Aside from jewelry, Zirconia has found its way into numerous applications. Most notably are dental crowns made of Zirconium Dioxide, also known as Zirconia Crowns (or Zirconia Caps). Zirconia is pure white in color in its original form, making it ideal for dental restorations. In the current era of glamour and fashion, the smile holds tremendous value to one’s self-esteem. People are growing increasingly wary of their esthetic appearance, paying most attention to their hair, skin and yes, their teeth. After all, no amount of cosmetics can hide an unpleasant smile due to damaged teeth. Cosmetic dentistry in Mexico involving Zirconia Crowns has played a major role in this regard to introduce a new technology and enhance the beauty of people’s smiles. Zirconium crowns are the top of the line crowns in any market. However, it’s very expensive. Here’s a price comparison.. They are not widely available among American and Canadian dentist. The availability among labs has been the major contributing factor. In Mexico, they are widely available. It’s the same material at a much cheaper price. Why choose Zirconia Crowns vs Porcelain Fused to Metal Crowns (PFM)? When considering esthetic or restorative dental treatment for damaged or decayed teeth, the role of porcelain crowns has played a vital role for millions. Porcelain Fused to Metal (PFM) crowns are simply dental restorations made of porcelain layered over metal alloy. They are capped over damaged teeth to restore their strength, durability, function and esthetics. Since porcelain gives a similar appearance to natural tooth structure, it is widely used by many dentists in Mexico. There are, however, certain disadvantages of PFM Caps compared to Zirconia Caps. Strength Stronger. You can step on a solid zirconia crown, but they won’t break. Can break with improper use. Corrosion No Corrosion. It doesn’t use metal. The metal base of PFM’s may corrode over time or cause a sensitivity reaction to the gums of some patients. Biocompatibility Better Biocompatibilty. Some people don’t like to have metals in their mouth. Many holistic dentists and naturopathic doctors also advise against Porcelain on Metal crowns because of the metal content. Aesthetics Better Aesthetics. They have more translucency than porcelain, making them ideal for cosmetic dentistry. The metal base in PFM caps has the tendency to be exposed over the years as the gums recede, giving a dark gray outline beneath the gums. Furthermore, to cover for the dark metallic base, porcelain has to be made more opaque and layered thicker over the crown. This makes them slightly less translucent that Zirconia. Gum Tattoo No Gum Tattoo. PFM’s can cause discoloration of surrounding gums. See these pictures of gum tattoo caused by PFM’s. Price. The average price of PFM crowns in Mexico is $250 – $400. The average cost of Zirconia Crowns in Mexico are $450 – $650. How is this strong material used by dentists in Mexico? 1. 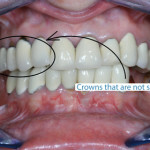 Single tooth crown restorations. 2. Dental bridges. Bridges are used to replace missing sections of the mouth. 3. Single tooth dental implant restorations. 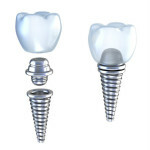 The dental implant is used to support a zirconium crown. 4. Hybrid dentures. If you are missing teeth, Zirconium hybrid dentures supported by implants are popular procedures to replace the entire top or bottom portion of the mouth. Zirkonzahn offers the best implant supported permanent dentures made with Zirconium material. What are the two types of Zirconium crowns? Some dentists in Mexico own their own CAD CAM Machine to make Zirconia crowns faster and with very little error. Of course, the dentist still has to be skilled in teeth restorations. Among the two types, Zirconia Porcelain Crown is more commonly installed by Mexico dentist. Instead of using metal for the base, such as with PFM, the dentist uses Zirconia as the base. The lab then adds Porcelain on top of the base to give the crown it’s dental anatomy. Porcelain is easier to shape than hard Zirconium. Solid Zirconia Crowns are entirely made of Zirconia. Usually, these caps are made by CAD-CAM machines. CAD-CAM machines shape a zirconium block to match the shape of the tooth. Solid Zirconia is more expensive because it uses more Zirconia than it’s other counterpart. Not all dentists in Mexico have CAD-CAM machines; hence, it’s not available among all Mexican providers. 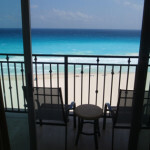 For anyone considering zirconia dentistry, Mexico is a great option. After all, who wouldn’t want a small vacation, only to return with a beautifully enhanced smile? Are you interested in getting affordable Crowns in Mexico? Contact Dayo to get beautiful restorations from trusted dentists. Why understanding dental implant abutments can save you an extra trip (and money) to Mexico?